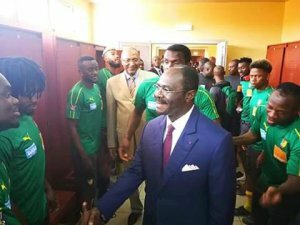 CRTV The Minister of Sports and Physical Education, Narcisse Mouelle Kombi and the President of the FECAFOOT, Seidou Mbombo Njoya have watched the indomitable lions train ahead of the qualifier match with the Comoros Island. 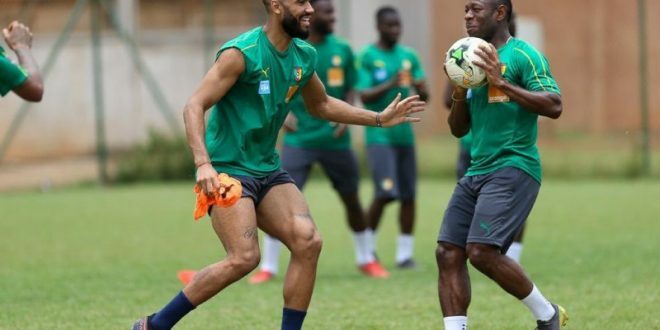 The two sport authorities attended this Wednesday’s training session at the Yaounde Ahmadou Ahidjo Stadium Annex Number One . Minister underlined the importance of the upcoming match and hope all Cameroonians shall continue to encourage the national team. Back on the turf, the Coach drilled the players on best attack and defensive approaches including ball distribution and accuracy on the pitch. Njie Clinton, Oyongo Bitolo, Jacques Zoua, Christian Bassagog, Choupou Moting and others present chipped in with other innovative techniques. The three goalkeepers, Carlos Kameni, Andre Onana and Ondoua all received new directives from the goalpost. The training session with all 23 players lasted an hour and more with a huge and enthusiastic crowd cheering. According to the programme, Thursday and Friday training sessions will not be opened to the public. In the meantime the Coelacanths of the Comoros arrive Cameroon on Thursday 21st March 2019. The team is expected to train at the Ahmadou Ahidjo Stadium on Friday 22. These cowards leading my country to the ground never stop to amade me! You’re going to support the national football team in your suits, instead of wearing the team Jersey. The power of Cameroonian government officials lies in their suits. libero. consequat. ut elit. odio id pulvinar et, Donec vulputate, mattis neque.